Autor Name: Sparhawk Laboratories, Inc. 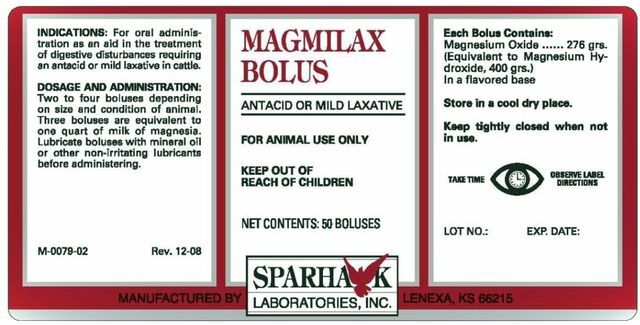 INDICATIONS : For oral administration as an aid in the treatment of digestive disturbances requiring an antacid or a mild laxative in cattle. DOSAGE AND ADMINISTRATION : Two to four boluses depending on size and condition of animal. Three boluses are equivalent to one quart of milk of magnesia. Lubricate boluses with mineral oil or other non-irritating lubricants before administering. Magnesium Oxide ..... 276 grs.